So congratulations to Glasgow City, who join some of the biggest names in women's football in Monday's draw for the last 16 of the Champions League. English champions Chelsea, Spanish duo Barcelona and Atletico Madrid, Bayern Munich and Wolfsburg from Germany, French duo Paris Saint-Germain and Lyon, Italian side Fiorentina, Rosengard and Linkoping from Sweden, Dutch side Ajax, Brondby (Denmark), LSK Kvinner (Norway), Slavia Praha (Czech Republic) and Swiss side Zurich will all be there too. Those ties will take place on 17/18 October and 31 October/1 November. Glasgow City head coach Scott Booth on BBC Alba: "I am just absolutely delighted for the players, with the amount of work they put in. They had a big job to do against a good side going forward. "It didn't go quite to plan. We had plenty of chances early in the second half and if we had taken one of those, it would have made it easier for us. But they worked so hard and really put their bodies on the line. "We didn't take our chances but the resilience of the players shone through, putting in tackles and keeping things compact. "It is a great achievement for Glasgow City to reach the last 16 of the Champions League." It was a tense night, but City again showed their maturity at this level. Goalkeeper Lee Alexander had to make a few saves, but City grew stronger as the game went on against a good side. They lost on the night but over the two legs they are deservedly through. They certainly made it hard for themselves but they did the hard work in the away leg two weeks ago. Things didn't go their way in front of goal tonight, but they stuck at it defensively. Carly Girasoli, given her age (16) and the stage she is performing on, was my player of the match. She stood up to everything that was thrown at her. That's it! It may not be the way they would have liked to progress, but it's job done nevertheless. 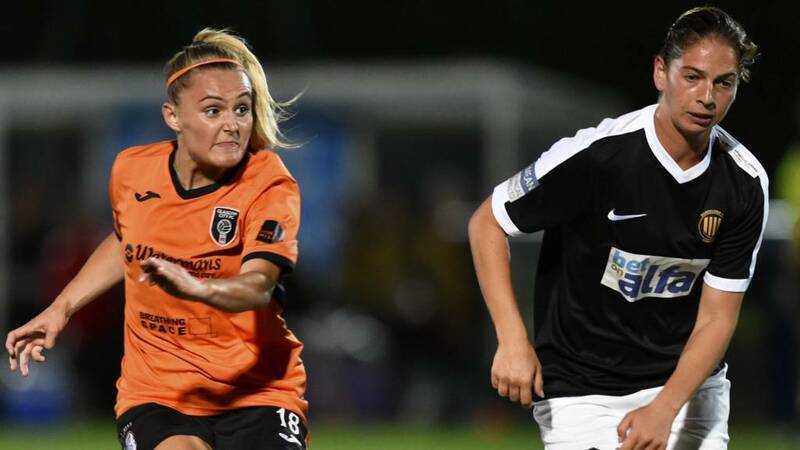 Glasgow City are into the last 16 of the Women's Champions League for the fourth time in their history. Glasgow City coach Scott Booth uses up a bit of time by making a second substitution, Jenna Clark replacing Kirsty Howat for the last knockings. Cristiano Solomou has looked a threat for Somatio all night. She lets fly from distance again and City keeper Lee Alexander has to move quickly to her right to prevent it sneaking into the left corner. We're into the last five minutes. Can Glasgow City keep their goal intact and reach the last 16? The attendance has been announced as 511. They have been kept well entertained for their £10. You get good value for money at women's football. City continue to press at the other end, Kirsty Howat with a powerful drive from the left side of the Somatio area that whistles past the far post. A reminder that this tie is not quite done yet for City. Cristiano Solomou unleashes a decent effort from distance, but it is comfortable for Lee Alexander in the City goal. Hannah Stewart, who joined City from Aberdeen in January, scored her first league goal for the club in Sunday's 6-0 win over Rangers. Her physical presence offers City something different now up front. We're into the last 15 minutes. A reminder that Glasgow City are heading for the last 16 of the Champions League - which would be the fourth time they have reached that stage - as things stand. Glasgow City coach Scott Booth sends on his first substitute, Hannah Stewart replacing Lara Ivanusa. Our man at Petershill Park (see previous entry) nearly spoke too soon. Cristiano Solomou's free-kick deflects off the City wall and a snap-shot forces Lee Alexander into a save, but there is a flag up for offside in any case. It could be famous last words, but City have completely nullified Somatio's attacking threat in the second half. But they need to take one of these chances and give themselves some breathing space. This time Abbi Grant curls in a wicked free-kick right-footed, from close to the left byline, but again Somatio keeper Anna James-Buhigas is equal to it, and palms it away. Danger at the other end for City as Rebecca Elloh weaves her way into the hosts' area, but a timely block relieves the pressure. Glasgow City are pressing hard for the equaliser. Nicola Docherty's strike is fumbled by the Somatio keeper and no-one can pounce on the loose ball, before Abbi Grant tries her luck from long range, but her effort drifts wide. Carly Girasoli, the 16-year-old schoolgirl at centre-back for City, takes a knee in the chest from Somatio goalscorer Krystyna Freda as she jumps for a high ball. It looked pretty accidental to be fair, and Girasoli is OK to continue after catching her breath. That is two top-class saves from Anna James-Buhigas. Both Sam Kerr and Kirsty Howat have done everything right with their chances, but the Somatio goalkeeper was brilliant in dealing with both.